Supra means “feast” in Georgian, but that usage came from the name of traditional Georgian tablecloths, also called “supras” and pictured here. Used for over 300 years, the colorful cloths with graphic patterns are an important part of Georgian tradition and were recognized by UNESCO as a “material monument” in 2017. It’s funny where passion can take you. Consider Jonathan and Laura Nelms: an attorney and environmental scientist who lived in Russia, fell in love with Georgian culture and cuisine and now are the restaurateurs behind Supra, Washington’s first Georgian restaurant. If you were connecting dots in the chain of events that led to a Georgian restaurant, the first dot would appear in 1989, where Florida high school student Jonathan Nelms meets a Georgian exchange student in his Russian class. The next year Jonathan became one of the first 50 Americans to be a high school exchange student in the Soviet Union, an experience that sparks his enduring interest in this part of the world. Jonathan, fluent in Russian, builds a legal career with a Washington-based law firm and handles their business in the former Soviet Union, frequently traveling to Russia for business and then living in Moscow for three years with his wife, Laura, and their daughters. In Moscow, they enjoy eating out at Georgian restaurants and start traveling to Georgia on vacations. 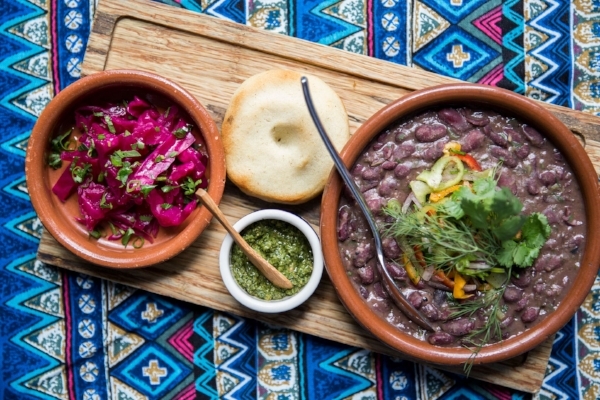 Lobio kotanshi, or red beans stewed with traditional spices, is served with pickled red cabbage and cornbread mchadi. “During our time in Moscow, we went to Georgia as often as we could, exploring different parts of the country. It is about the size of West Virginia, and takes about eight hours to cross the county. It was such a contrast from Moscow daily life. The country is so beautiful and the people are so warm. I feel like unique is an overused word for a culture, but that it what it is, unique, it is like no place else I’ve ever been,” Jonathan says. Bostneuli tolma, or grape leaves stuffed with rice, vegetables, and yogurt, make for an excellent opening dish. The restaurant’s name, supra, originally described traditional Georgian tablecloths, but now has also come to mean feast. Authentic touches are everywhere in the decor, and the local Georgian community has given Supra a very warm reception; the embassy staff are frequent visitors for lunch and dinner. It helps that one of the top chefs from Georgia, Malkhaz Maisashvili, was brought on as executive chef. It is a wonderful place to dive into a culture that you may not know much about: Traditional Georgian dishes abound, including favorites kupati (pork and beef sausages with fried pickles) and many variations on the famous Georgian baked khachapuri. Jonathan’s favorite is pkhlovani, a khachapuri with spinach and cheese. He also recommends cold yogurt soup with radishes and cucumbers and or trying roasted meat with fruit sauces, a Georgian style of preparation. 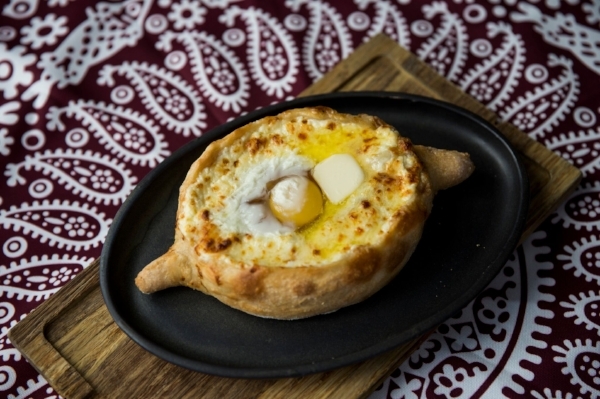 Ajaruli, the most popular style of khachapuri served at Supra, features bubbling cheeses and a fried egg. And then there is the wine. Supra’s wine list is one of the best showcases for Georgian wine in the U.S. It doesn’t hurt that the top importer of Georgian wines is here in Washington, DC: Georgian Wine House. For wine geeks, Georgian wine has long been on the radar. The country is known for still producing wine in ancient way using qvevri, large clay jugs. Even though about only 3% of Georgian wine is produced in this traditional way that goes back 8,000 years, the country makes wines that are considered very fine. Jonathan loves seeing the wine industry grow and mature in Georgia and enjoys providing a home for small vintners on his wine list. He tells me about helping make wine at a family workshop in Akura in 2015, and now he has their wine, Blui’s Wine, at their restaurant. Georgian wine is famous for its traditional method of preparation, using qvevri, or large clay jugs. Brockett is here to talk about the art of Georgian toasting and Georgian wine. In the Republic of Georgia, there is no time busier for toasting than the holidays. Georgia religion is Georgian Orthodox, and feasting happens constantly from December 25 to January 14, when people celebrate Georgian Christmas, the New Year and the old calendar New Year by gathering with friends and family. No Georgian feast, or supra, is complete without a toastmaster, or tamada. The tamada’s role is to give unity to a feast by leading a series of toasts, always with wine. A tamada is almost always a man, usually an extroverted individual, a quick thinker with quick wit. They learn their role through practice and study. The tamada gives each supra structure—after always starting with three scripted toasts (the first is always to God), the tamada then goes on to full-on speeches. The tamada also opens topics and guides the conversation; a typical toast is on friendship. Then a discussion ensues on that topic by the guests and the tamada pays attention, closing the discussion and opening another one with expert flair. A wedding may have 30 to 40 toasts; a family meal might have six to eight. By design, a typical Georgian feast brings together people who know each other and those who don’t, and it is also common to have guests come and go from the table, going from one supra to another supra. Noel Brockett of Georgian Wine House in Washington, D.C.
Noel Brockett knows the art of toasting intimately. He is married to a woman from Georgia and is a partner in Georgian Wine House with Dr. Mamuka Tsereteli, a lecturer at Johns Hopkins and president of the America Georgia Business Council, who founded the business with a group of friends who saw the possibilities of importing and promoting Georgian wine in the U.S. With the political changes in 2004, Georgian wine was no longer embargoed by Russia. Brockett sees the opening of Supra as a great chance to educate people on Georgian wine culture; there are around 50 wines on the list at a time. Orange wine or amber wine production is the oldest way to preserve wine or make white wines. Amber wines from Georgia have become very popular. Sebastian Zutant of Primrose and Red Hen was an early adopter, and they are on the menu at Compass Rose and Maydan and, of course, at Supra.